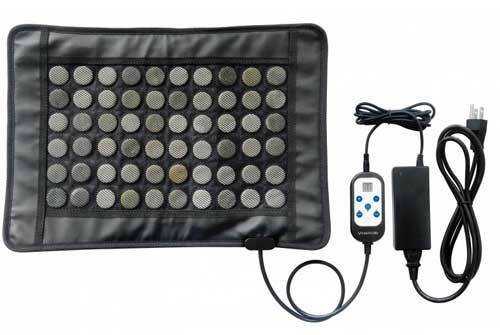 If you suffer from chronic joint or muscle pain or are recovering from an injury, far-infrared heating pads can help you. Conventional heating pads heat only the epidermal (outer) layers of the skin, penetrating up to 3mm (3/25 of an inch). The WelAide emits infrared heat, which penetrates deeply into joints, muscles and tendons (at least two inches). Blood flow increases to the affected area for faster healing and pain relief. This type of heat is also warm enough to feel soothing, but not so hot that you can overheat or burn yourself. The pads also contain large round pieces of jade. There is a special relationship between natural jade stone and far-infrared (FIR) heat. Jade is one of the best natural conductors of FIR heat; when FIR waves pass through jade, the stone stores and conducts the heat evenly to your body. Jade also emits negative ions to create an overall feeling of well-being. This soft, flexible pad can be folded and placed on almost any part of the body. Hold it flat, lie on it, or roll it around your arm or leg. Adjustable digital remote with six heat settings and auto-off timer. Four sizes: Extra Small measures 8" x 10" with 15 pieces of jade; Small (pictured above) measures 14” wide x 20” long with 54 pieces of jade; Medium is 21" x 30" long with 90 pieces of jade; Large is 24" x 50" with 286 jade pieces. Click here for more information on far-infrared heat. Also available in a flexible wrap without jade. There is a restocking fee of 15 percent on WelAide pads that are returned. Please note that additional shipping applies for Medium and Large units, depending on your location. Call us or email us for rates, or we will contact you after you order with the shipping information.